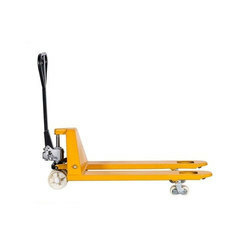 Beam Pallet truck has a capacity of 600 / 1200 / 2500 Kg and the fork length of 1200 / 1500 / 2000 / 2200 / 2500 / 3500 / 4000 mm depending on Beam length & Machine Length. 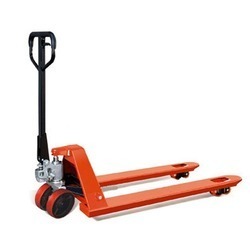 We present Heavy Duty and high performing beam pallet truck which is available in accordance with our clients requirements. These high quality engineered machines are provided with corrosion and abrasion resistant polish to prevent them for getting deteriorated. These meet all criteria of durability. These trucks find their application Textiles, Paper Industry in warehouse, industrial environments. The ‘Gujarat’ is making Hydraulic Pallet Truck for their clients since the last 40 years. The ‘Gujarat’ Hydraulic Pallet truck is manufactured from robust steel to give high strength with low weight ratio. The forks are formed from tested steel in one piece ‘C’ section for greater strength. Premium quality steel draw bar also serves as a pump lever and acts on rear roller. The Hydraulic Unit is easily removable and fully sealed. Maintenance free pump unit is protected against dirt and moisture to give a full 115 mm lift. The plunger is coated with Chromium to reduce wear and corrosion. It includes a large diameter lifting ram for low working pressure and a longer seal life. 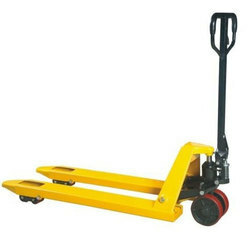 We provide Pallet Truck with Skid Adaptor. 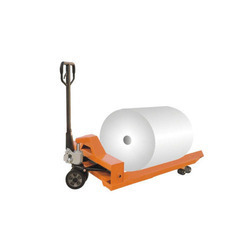 We provide Gujarat SWIFT Pallet Truck to our clients. 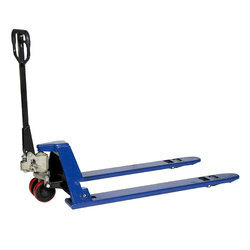 Pallet Trucks are manufactured using well-tested and pre-treated steel; these pallets are the perfect solution for all sorts of material handling purposes. The range is well-constructed by our skilled workers, keeping in mind its application area. Used Extensively in Industries like Engineering, Paper, Textiles, Pharma, Chemicals, Wood, Airlines, Logistics, FMCG etc.